Most new boats arrive from the factory with the equipment to meet the minimum Coast Guard safety requirements, and not much more. Of course, there may be a suite of electronics with all the latest WiFi, Bluetooth and "smartboat" tech, a telescoping boarding ladder, comfortable cockpit cushions, color-coordinated fenders, and everything else needed to dazzle the customer at the boat show, but there is a lot of safety gear that is not included. What else should you purchase? U.S. Coast Guard regulations are designed to keep you safe on the water. The safety gear that you are required to carry depends on the size of your vessel and we'll outline exactly what you need to meet the coast guard requirements. Keep in mind that these are minimum requirements and we'll discuss extra safety measures later on that you can take to keep yourself and crew safe if disaster strikes while you are on the water. Personal Flotation Devices: One Type I, II, III or V per person. PFDs must be CG approved, wearable by the inteded user and readily accesible. Fire Extinguishers: One B-I, any type. Fire extinguishers required on boats with enclosed engine compartments (not outboards), enclosed living spaces or permanent fuel tanks. Visual Distress Signals: Night signals required when operating at night; date of manufacture must be within 42 months of the current date. Sound Producing Devices: Horn or whistle recommended to signal intentions or signal position. Personal Flotation Devices:One Type I, II, III or V per person plus one Type IV throwable. PFDs must be Coast Guard approved, wearable by the intended user and readily accessible. Visual Distress Signals: Minimum of three-day use and three-night use or three day/night combination pyrotechnic devices. Non-pyrotechnic substitutes: one orange distress flag (day-use) and one electric SOS signal light (night-use). Pyrotechnic signals must be have a manufacture date within 42 months of the current date. Personal Flotation Devices: One Type I, II, III or V per person plus one Type IV throwable. PFDs must be Coast Guard approved, wearable by the intended user and readily accessible. Sound Producing Devices: One bell and one whistle or horn required to signal intentions or position. Fire Extinguishers: Vessels weighing up to 50 gross tons must carry at least one B-II extinguisher. Vessels weighing 50 to 100 gross tons must carry two B-II extinguishers. If you're on the water after dark you will need navigation lights to legally and safely operate your boat. The lights that you need depends on the size of your vessel and our West Advisor Article on Navigation Light Rules will tell you what lights you need. The lists above will satisfy minimum requirements for operating your boat, but there are other saftey products that have proven their worth when the worst happens on the water. While these products will require a little more investment on your part, they are an investment in the safety of yourself and others on your boat. At West Marine, we are commited to making life on the water as enjoyable as possible and having the right safety gear is part of that. In 2017, the Coast Guard counted 4,291 accidents that involved 658 deaths, 2,629 injuries and approximately $46 million dollars of damage to property as a result of recreational boating accidents. 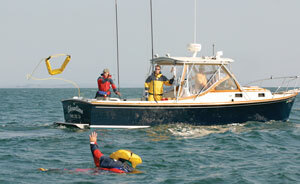 In 76 percent of fatal boating accidents the victims drowned. Of those who drowned in 2017, 84 percent were not wearing a life jacket. In most states children are required to wear a personal flotation device (PFD), but adults can use their discretion, and many boaters choose to leave the PFD sitting in a locker. If your boat is hit by a wave or collides with another boat and you are knocked overboard whatever safety gear you are currently wearing is all you will have and your PFD will remain secure on the boat while you struggle to stay afloat. The solution? Invest in a comfortable PFD appropriate for your type of boating and wear it every day. We carry an extensive selection of PFDs including inflatable life jackets which are unobtrusive until you need them. Lower priced models like the West Marine Inshore PFDs are available with 25.5lb. of buoyancy, instead of the 35lb. coastal or offshore versions. These streamlined, lightweight vests don't inhibit your movement and are perfect for inshore boating on lakes and rivers. They are available in automatic, manual and manual beltpack activation. 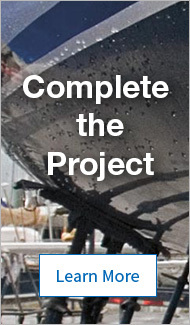 Lifesling2 is the most widely-accepted method to get an overboard crew member back aboard your boat. Hoisting overboard crew members back on board is challenging even in the best conditions. Extensive testing of crew overboard recovery gear in San Francisco Bay produced a clear consensus that one product, the Lifesling, is a great device for getting a person back to the boat and aboard safely. The Lifesling2 includes a flotation collar (a hybrid of a traditional horseshoe buoy and a helicopter rescue sling) with 125' of floating retrieving line. It can be towed to the victim so they do not need to swim after it and then used as a lifting sling (using a separate hoisting tackle). The Lifesling Inflatable combines these capabilities with the compactness and throwability of a rescue throw rope bag, inflating instantly on hitting the water. 33 percent of the boats that request a free safety inspection from the Coast Guard Auxilary do not have a VHF radio. A VHF radio is a key safety item that all boaters should carry for routine communication with other boats and digital selective calling for an emergency. DSC is like 911 for your boat—better in fact, because rescuers have the technology to determine exactly who and where you are, and sometimes the exact nature of your emergency. But to make DSC work, boaters need three things: a DSC-equipped VHF, a connection to a GPS receiver (to pinpoint your position so rescuers can find you), and to register for a free MMSI Number (so they know who you are). Push one red button on your radio, and it automatically sends a distress message to everyone within radio range. For more information on how VHF radios help in an emergency read our West Advisor Article on Making a Mayday Call on Your VHF Radio. 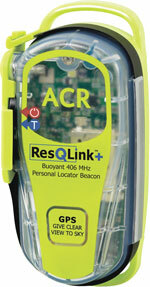 An emergency position indicator radio beacon (EPIRB) or a personal locator beacon (PLB) is an excellent addition to your safety gear and will make it much easier for rescue crews to find you in an emergency. EPIRBs and PLBs are able to transmit your location and your identity to rescue teams from anywhere on the globe and are free to use once you purchase the unit. Our West Advisor article on Selecting an Emergency Beacon has all the information you need for choosing which is right for you and your crew. Water temperature: Few environments in the world are as dangerous to humans as cold water. If you operate your boat in the Pacific Northwest, the Great Lakes or in other cold-water regions, bring gear that protects you and your crew from hypothermia. Poor visibility: High quality navigation lights, sound signals and radar units can lessen the danger of low visibility conditions like fog or rainsqualls. Distance from help: If your cruising route includes the coast of Mexico, Bermuda or a trip to Hawaii, you'll be far from the convenience of your local boating supply store and far from the security of the US Coast Guard. The need to be self-sufficient is greatly increased away from inland and coastal US waters. Rapidly changing weather conditions: Many boating areas are subject to squalls or other fast moving weather systems that can stir up trouble in a hurry. Boats operating in these areas should have gear aboard which can be used defensively, like larger anchors, lightning detectors and grounds, mainsail reefing equipment, drogues and sea anchors. Rough seas: Many areas, like San Francisco Bay in the summer, have consistently strong winds and heavy chop. That makes for great sailing, but also raises equipment requirements for sailboats and powerboats alike.